Growing Birds of Paradise is pretty easy to do. I have provided you with the proper techniques to plant your tropical plant. Keep in mind if you purchase a young white bird of paradise or an orange bird of paradise you may not see the flowers for several years. The two varieties of tropical plants have the same techniques for planting and growing them. 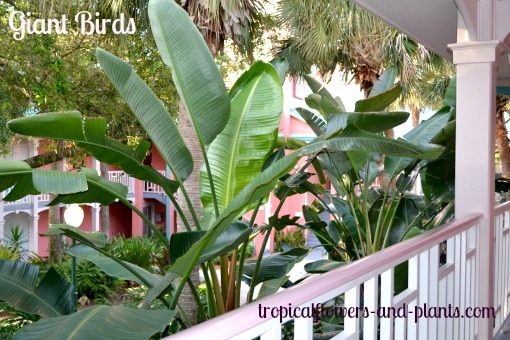 1) Pick a spot in your yard that will allow the Bird of Paradise needs ample amount of room to grow. Remember, depending on which tropical bird you pick will decide on how much room you will need. White Bird of Paradise needs plenty of room unlike the Orange Bird. *Where you live in the world is another factor. If you live somewhere that the temperatures drop below 50 degrees you may want to consider keeping your Bird of Paradise in a pot. *These exotic plants do well in areas that receive full sun= about 6 hours of sunlight. However, it is not uncommon for them to grow in a shaded area. This may be due to the favorable weather conditions in that specific area. When these tropical plants have a little shade the foliage tends to be a darker green. 2) Dig a hole that is twice the size of the plants diameter and as deep as the root ball.Before placing your tropical plant in the hole, I always try (with my hands) to break up some of the roots on the very bottom. 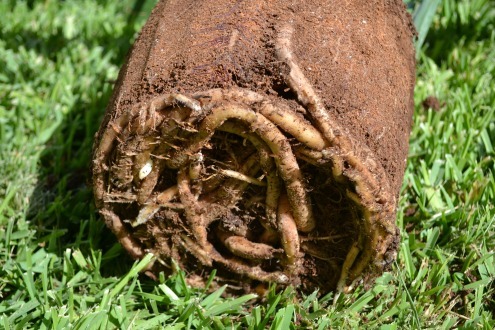 *Root ball is simply the roots on the plant that have grown in the container. When you take the plant out of the container you will notice the dirt is compacted around the root ball. *If you are planting other white birds in the same area allow 6 feet in between each bird. This space will give each bird the room to multiply and grow. 3) Place plenty of dirt in the hole and around the hole. Make sure to step around the tropical plant with your foot. This helps the dirt fall into the open areas and causes the dirt to become more compact. 4) Water your Bird of Paradise. In the beginning stages of growth, you will water your tropical plant every day. This will help the plant's roots to establish in its new area. Once the Bird of Paradise is established you may reduce watering. *Around the fall and winter months allow the tropical plant to dry out a little before watering it again. 5) Placing mulch around the plant. Make sure not to get the mulch on the stem of the Birds of Paradise……..WARNING if the mulch is against the stem it has an increasing chance of getting stem rot. Using a sharp pair of shears trim any leaves or flowers that have died. Make sure to cut the whole leaf and not just the damaged area. This will help reduce any fungus that might grow and allow room for new growth. Remember the plant may regrow a leaf but it may not regrow a damaged section. In a harsh case, where all the leaves and flowers have died off, cut the entire plant down to the soil. It may shock the tropical plant but, as long as the roots are not damaged the tropical plant will regrow. Aphids is a fancy word for a bug who feeds off the sap that the plants produce. They tend to multiply quickly. The great thing about these tropical plants is that they don’t normally get insects or disease. If you happen to find aphids on your Birds of Paradise you can remove them with a damp cloth. If they continue to come back you can treat them with soapy water on the colonies. The soapy water will interfere with the aphid’s ability to breath. If this does not do the trick you may have to get a stronger treatment to kill them.